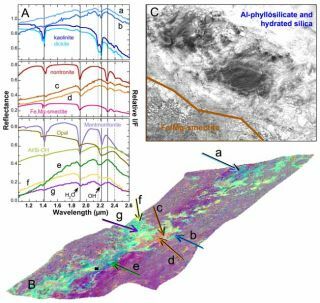 (A) CRISM spectra from several images compared to lab spectra of clay minerals, (B) mineral indicator map of CRISM image 43EC (~10 km across) draped over MOLA terrain with 10X vertical exaggeration where several of the spectra were collected, and (C) a HiRISE image showing the transition from the smectite we see in many regions to hydrated silica we see surrounding this on the higher edges. Weare investigating the surface mineralogy of Mars in order to provide clues toits geologic history including when and where the water was present. The CompactReconnaissance Imaging Spectrometer for Mars (CRISM) is currently flying onthe Mars Reconnaissance Orbiter(MRO) and collecting multiple new images of Mars each day. CRISM ismapping Mars with 100-200 meters/pixel images with 72 channels across the visibleand near-infrared wavelength region. CRISM is also collecting a few moredetailed images of targeted spots each day at 18 m/pixel with 544 channels.CRISM is expanding the mineral identifications made on Mars with the EuropeanMars Express/OMEGA (Observatoire pour la Min?ralogie, L'Eau, les Glaces etl'Activit?) at 300-1500 m/pixel surface resolution. The High Resolution ImagingScience Experiment (HiRISE) camera on MRO is taking pictures at submeterresolution, which can be combined with the spectral data from CRISM and OMEGAto gain information about the surface textures. Our groupis working on identification of clay minerals in CRISMimages as these minerals tell us about water on Mars. Clay mineralstypically form in marine sediments. They also form as volcanic ash and tephraare altered in the presence of water. Hydrothermal activity produces clayminerals as well. We are finding clays in the most ancient terrains that formed4 billion years ago on Mars. These indicate that there were widespread bodiesof neutral water on Mars at that time. Two regions on Mars that show highabundances of these clay minerals are called Mawrth Valles and Nili Fossae. Both areunder consideration as landing sites for future missions, including the Mars Science Lab(MSL). TheMawrth Vallisregion contains one of the largest and most diverse outcrops of clays. Detailedanalyses of the CRISMspectra in this region indicate the presence of expansive deposits of clayscalled smectites, as well as smaller outcrops of kaolinite, hydrated silica andmica. Smectite clays are also common in California. They expand readily toaccept more water and contract making huge cracks when the ground dries. Theseare likely the clays responsible for shifting our homes here in California during wet and dry seasons so that our doors don't close properly. They alsotend to make the ground very hard and are the reason why we need to add soilamendments to our gardens to make most plants grow well. Reflectancespectra exhibit dips or "bands" due to absorption of energy at thefrequency of molecular vibrations for species of interest. For detection ofclay minerals, we are investigating absorptions due to water and OH in themineral structure. The frequencies of these mineral absorption bands depend onthe mineral structure and which metal cations (Fe, Mg, Al) are bound to themolecules. We match spectra from CRISM to spectra of minerals in the lab inorder to identify the specific types of clay minerals present as shown inFigure 1 A below. We plot certain combinations of channels from the CRISM imageto generate mineral indicator maps as shown in Figure 1 B. Here theFe/Mg-smectite is orange, the Al-phyllosilicate is blue, and the hydratedsilica/mica is green. We also use HiRISE images to look in more detail atspecific locations. An example is shown in Figure 1C where we see a transitionfrom the Fe/Mg smectite at the bottom left to the Al-phyllosilicate andhydrated silica material at the upper right. Theidentification of clay minerals on Mars with CRISM and OMEGA implies liquidwater was present on Mars. These clay layers are very old and were buried longago by mantles of volcanic material. We see the clays under this layer inplaces where the volcanic material has been eroded away. We continue to searchfor more pockets of these clays that are visible on the surface in order togain an understanding of the extent and character of the clay deposits and theaqueous events that created them. We're following the water on Mars in thesearch for evidence of life.